Even Miles was surprised when he saw Kit at the dance. She was wearing a frock of dark-blue taffeta, with a close-fitting bodied and a full skirt. Its very simplicity made it stand out amongst the more conventional dance frocks worn by most of the other girls. Her only ornament was an old Italian necklace, curiously wrought and set with sapphires. observations: Earlier this week, Guest Blogger Lucy Fisher gave her opinion of this book, and her entry explains some of the plot. Aunt Priscilla is the nearest thing to light entertainment here – later on she is going to want to knit woollen petticoats for some little children (if that inspires you, you can find a pattern here). This was an award-winning book in its day, though it is hard for modern eyes to see quite why, and I’m not sure today’s Twilight-loving teenagers would see it as anything but a period piece: 'curiously wrought' - there's a Biblical phrase you don't see so much anymore. Kit Haverard (whose schooldays were recounted in The Lark in the Morn, entry coming soon) is moving to London and pursuing her singing career. She gets a Barbara-Pym-esque office job – tea in the basement, typing with two copies, a visit to the Salad Bowl as an occasional treat – and has lessons with Papa Andreas and his household of adoring women. Kit is what would nowadays be diagnosed as ‘a passive-aggressive nightmare’ – always hard done by, a simmering cauldron of rage that nobody notices her, while she pretends that the last thing she wants is attention. She is surrounded by countless characters, lightly sketched in, many with strange nicknames, and it is very difficult to work out which of the boys is going to go off with which of the girls, or to care. Tucked away there are details of life in the flat with the girls, which could almost be interesting. But, for example, Vipont shows someone making supper, speaks of the pan on the stove, worries that it will burn, says it would be improved by the addition of a tin of spaghetti (! – as what wouldn’t): but never says what is being cooked. Who can say if it’s a failure of imagination or an insult to the reader. 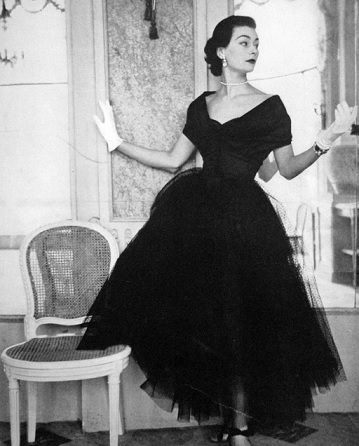 The picture appeared in Vogue in 1951, and comes via the wonderful Clover Vintage Tumblr. The Nutmeg Tree blue dresses would have done nicely too. I think it is Kit's censorious admirer who speaks of the girls "pigging it" in the flat. He probably calls the place "pokey". Girls sharing a flat was quite avant garde in those days. Moira - It's a pity you didn't find this a more engaging look at that time in that place. And it's interesting that Lucy would mention the term 'pigging it.' That's used in Agatha Christie's Taken at the Flood too. Certainly wouldn't be a term we'd use now and I always find that evolution in our expressions really interesting. Back to the story though...it does sound like quite a period piece even if we wouldn't find it deeply absorbing today. And that dress in the 'photo! It's perfect vintage. The expression 'pigging it' sounds old-fashioned but familiar to me - probably from books! I'll have to look it up in the Christie, Margot. I think I would have liked more detail about the flat-sharing - as Lucy says, it was quite racy of them.